Hey Guys! My mind has been rambling all over the place lately and I know I haven’t really given you much in the way of new projects but here are some things that are on my mind! I thought this would be a fun get to know me post. 1) My to-do list is too long these days, so today I took things off that seemed unrealistic or non important-it was freeing! 2) I am super duper super excited about this Saturday, me and Will are headed to Clines Antiques, a dealer I have wanted to visit for years, follow along on Instagram to see what I find. 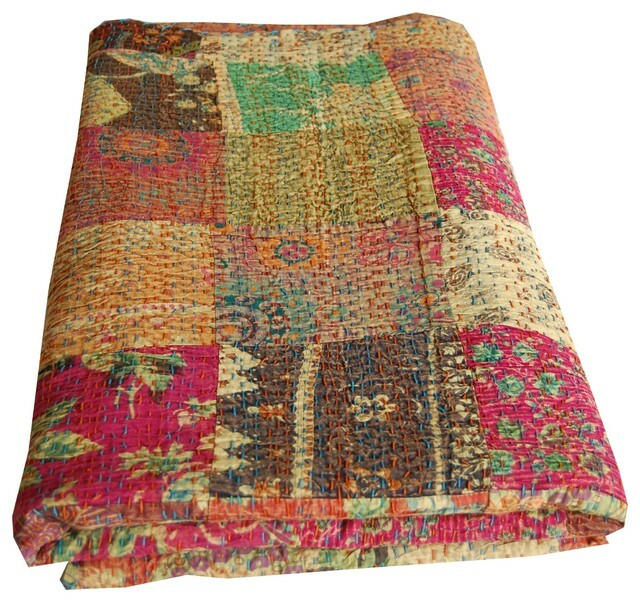 3) I am really loving Kantha Quilts, Pottery Barn has a “new” version but it is so expensive I have been looking for a vintage one. Love the patterns and sticking. 4) I bought a paint by number tonight from www.easyart123.com, I can’t wait to paint it! I thought it would be a good de-stressor. 5) I am 23 weeks pregnant now! WOW. Over half way. 6) So far my least favorite pregnancy symptom is acne, I feel like an insecure 16 year old all over again. 7) Next week I am headed to Orlando, FL for Coverings on a work trip. This is a huge tile & stone tradeshow, follow on Instagram for my favorite new looks. 8) I am knee deep in nursery decorating. I’ve painted. I’ve stenciled. I’ve got furniture. A rug is on the way. Fabric for curtains has been chosen. It’s all really sweet. 9) I am power washing our huge fence a little bit each day after work to prep it for staining. 10) Hoping the stain color will grow on me, not loving it. Non-returnable. Should have tested it first. 11) I am still searching for a small rug for the bedroom, I bought new white bedding so you would think it would be easier. 12) We got a new mattress two weeks ago, I am sleeping much better! 14) We are keeping the babies name a surprise until she is born. Still haven’t 100% decided on the full name. 15) I had to schedule my feline baby, Nipper, for a teeth cleaning and I am scared of leaving him at the vet for a full day. 16) I am SO GLAD it is SPRING and the weather is warmer!!!!!! 17) I am looking forward to planting some new plants very soon. 18) I feel like I need to read more now while I have time but I am addicted to the Bee Brillant game on my phone. 19) Maternity clothes are not my favorite, not so stylish. But comfy. 20) Baby clothes are adorable! Especially funny onesies. Well that is my current state in a nutshell. Have a good week my friends! I enjoyed this post. Nice to see inside your thoughts. Now I'm wondering what you cross off that list of to do's. Also, I'm still jealous about you going to the antique place.